"I'm John Jungmann I was the center tenor for the 2002 Revolution. Last year was my first year of drum corps and I will age out in 2004. 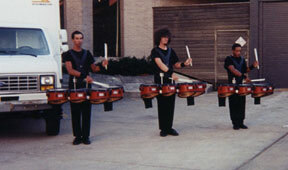 Attached is a picture of the 2002 Revolution tom line. We were in warmup for our finals performance in Madison. Left to right is Triston, me and Lamar." Thanks John! E-mail your Forzato submissions to dave@dci.org along with where and when the photo was taken, and send some biographical information about yourself as well. We'll give you full credit. Also, let us know if you want your e-mail address included, to get feedback from other drum corps fans.